It has been brought to our attention that our "Donate" link went to the MCF's donate page. This page runs a script based on the boxes you select. As a result some brethren have completed the incorrect form online. We cannot link direct to page as there is no separate URL to the page you need. So we have created this page to help explain what you will find on the MCF donate page. When you click on our donate button (on this page) it will take you to MCF Donate page where you will see the following screen. Select the third option as marked below. 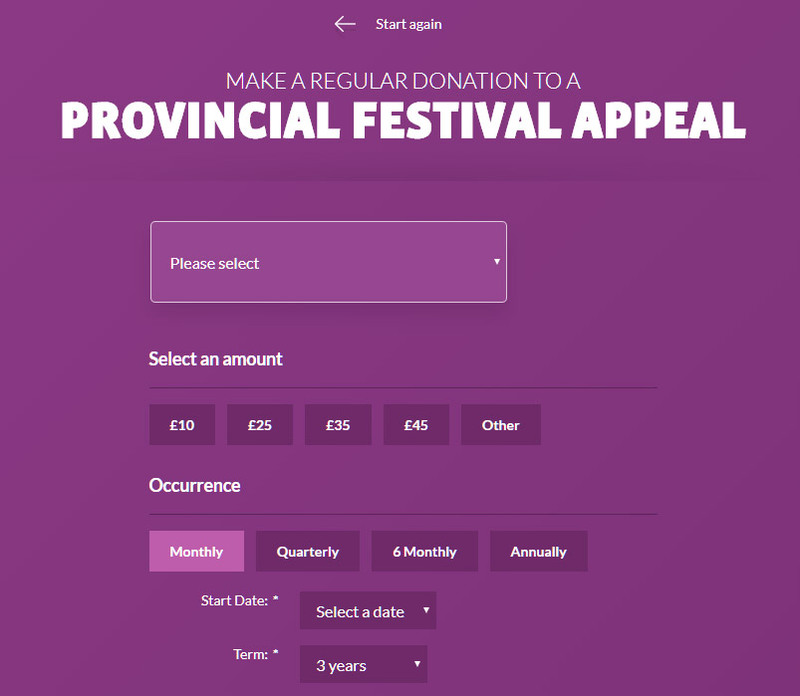 Once you click that third box labelled "Festival Appeals" you are on the correct route for adding your donation. The next screen will look similar, but the differences are single donation, regular donation and start fundraising. For those who wish to make a single donation to qualify for their chosen level of jewel then select the first box by clicking on it. 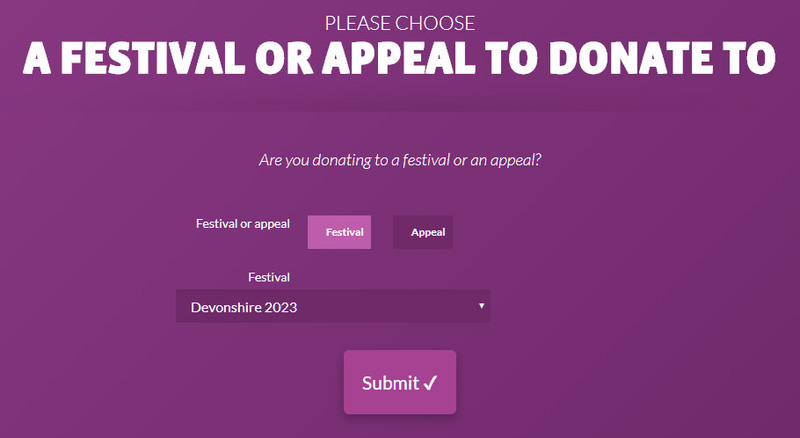 For those who wish to pay by Direct Debit over the course of the festival please select the second box by clicking on it. 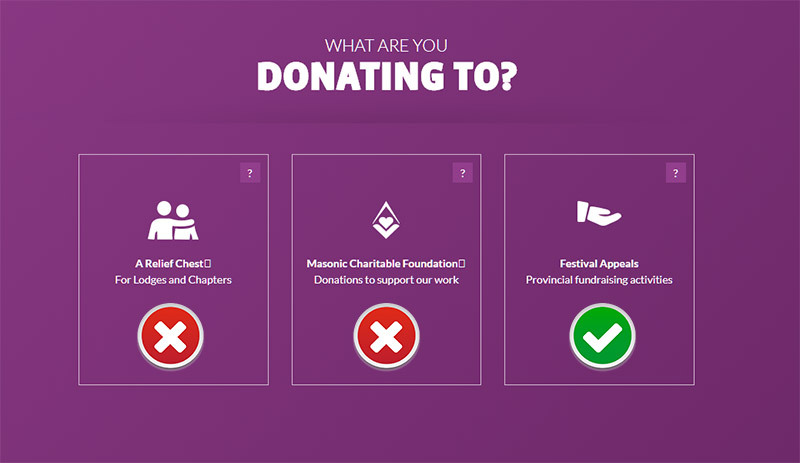 If you choose to pay by Direct Debit over a longer period then selecting the regular donation option on screen two will give you the following screen. The first part of the screen shows the options available. The box that show first is a dropdown selection of festivals. Please ensure you have selecetd "Devonshire 2023". You can then select an amount. The lowest qualifying donation for a jewel is £300 which is £5 a month for 60 months. To set that as a monthly payment you can click "Other" and a new field appears asking you to enter the amount you wish to pay. You then set the frequency of payments and select a start date and the term of the payment. Now you proceed to add your presonal information. Please do not forget to add details of your Lodge or Chapter as this will count towards the Lodge / Chapter Patron recognition. Continue to complete the form as instructed. If you are a tax payer then please consider checking the Gift Aid Declaration to help increase the donations.